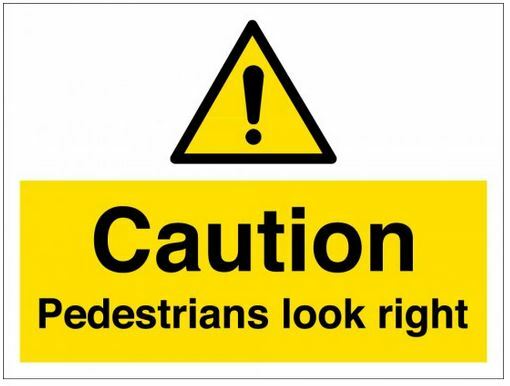 Now that we are in England, we need to relearn the art of surviving as a pedestrian in a country that drives on the wrong side of the road. Our penchant, of course, is to look to the left as we step off the curb, forgetting that in the UK, as well as most of the former British colonies, the traffic comes from the other direction. In past adventures, we've had a few near misses with double-decker buses and taxis before we got into the swing of things. Hopefully, we'll survive long enough to get into the habit of looking the other way. We won't be driving on this trip, so relearning to drive on the left is, fortunately, a non-issue. We have had some exciting experiences on past trips, however. On our first ever attempt to drive in the UK, we went directly to the airport car rental area and I promptly got into the wrong side of the car. It took me a moment to realize there wasn't a steering wheel on the left side, and as Marcie and I swapped sides, I attempted to look as if we really meant to do this – we had merely changed our minds as to who was going to drive. The car had been backed into its space, and we pulled out to the right exit gate – which, of course, since they drive on the left here, was not the exit, but rather the entrance gate. “No problem. We'll just back up and move over to the correct gate.” After five minutes of futilely trying to figure out the secret to getting the gear shift into the 'R' position, Marcie and I got out and pushed the car back into its original slot – amid the applause of the drivers of the dozen or so cars that had queued up waiting to get into the parking garage. With the help of the operator's manual, we figured out how to get into reverse, and set out again, this time going out the actual exit. After a few hours of driving, if we kept repeating the chant “Stay left - stay left” over and over, and remembering that the side with the steering wheel needs to be towards the center of the road, we did pretty well. Roundabouts are pretty commonplace in the U.S. these days, but that trip was also my first exposure to them, another minor adventure. After awhile, I came to like them. They preclude having to make split second decisions – we could loop around 37 times if need be while figuring out which exit we should be taking. An idiosyncrasy with right hand drive vehicles is that the turn signal lever and the wiper control lever are reversed from what we're used to. I would invariably turn the right turn signal on when I meant to turn on the wipers and vice versa. One Australian friend told me he always knew when a Yank was driving, because they signaled their turns by turning on their wipers. We spent considerable time driving in New Zealand, Australia and South Africa, and eventually did okay. By the time we returned to the U.S., however, the job was to unlearn the new habits and relearn the old. This wasn't too difficult - except for the wiper/turn signal issue. I'd say that it was at least a couple months before I had a better than 50:50 chance of getting it right the first time. I'm not the only one who has an an occasional problem, however. After we had been back a few months, we were driving along a country road in New England. As we came over a hill there was an oncoming car whose driver must have been a Brit, because he was driving on our side of the road. I said a few words to Marcie about the twit driving on the wrong side of the road and flashed my lights at him, but instead of changing lanes, he flashed his back at me. That's when Marcie began chanting “Keep right – keep right”, whereupon I turned on my wipers and returned to the right side of the road.